The following article originally appeared in the Economic Times on January 1, 2014. The year 2013 certainly confounded many people’s expectations. Just 12 months ago, Kim Jong-Un’s avunculicidal urges were firmly in check, the face of the Catholic Church was that of a conservative German pontiff, and the Boston Marathon, Westgate Shopping Centre and Rana Plaza were untainted by their now-deadly associations. Hakimullah Mehsud was still a Grade A miscreant, Nelson Mandela a living legend, and Edward Snowden an unknown US government contractor. Mohamed Morsi was top dog in Cairo, the US-Iran cold war looked distinctly frostier, and Turkey was making Kanye West look like a paragon of restraint and humility.World trade talks and the Indian Test team were deemed lost causes, Malala Yousafzai had yet to become a darling of the Western media, and a lot fewer people could identify Depsang on a map or tell you what CHOGM stood for. Much, however, has not changed, or at least not as significantly as many predicted. Bashar al-Assad still clings to power in Damascus as mounting deaths from the Syrian civil war look set to surpass the number of lives lost in the entire Arab-Israeli conflict. China — despite a far from seamless political transition — has staved off some of the more bearish predictions about its economic and political future (for now). The European economy and currency union, far from having collapsed, have puttered along and possibly emerged stronger. Meanwhile, amid its many domestic preoccupations, the US somehow forgot that it had announced a pivot to Asia. 2013 was also a year of elections, particularly in India’s neighbourhood. Nepal, Bhutan and the Maldives all went to the polls, although in circumstances that did not necessarily do credit to Indian diplomatic tact. Pakistan, quite notably, saw a peaceful transition of power between two democratically elected governments for the first time in its history. And farther afield, important leadership changes took place in Beijing, Tehran and Canberra, all of which were closely watched in New Delhi — or ought to have been. Rather remarkably, India’s foreign affairs over the past year were also closely tied to developments at home. Domestic politics was at least partly to blame for India’s inability to secure a beneficial agreement with Bangladesh. Regional party dynamics ensured a boycott of the Commonwealth summit in Sri Lanka. The phrase “dehati aurat” assumed a context and resonance that few could have imagined. And popular outrage around specific incidents coloured India’s relations with both China and the United States, albeit in somewhat more understandable circumstances. What, then, does 2014 hold in store for India and the world? To use the Rumsfeldian epistemological glossary, a glance at the international calendar reveals several known unknowns. Should we expect national governments to make a power grab for control of the Web at April’s internet governance meeting in Sao Paulo? What will mid-term elections in November mean for US President Barack Obama’s last two years in office? Will we see two new countries emerge in the forms of Scotland and Catalonia, after planned referendums? Will the Winter Olympics in the Russian resort of Sochi and the FIFA World Cup in Brazil be overshadowed by political controversy? And might the climate summit in Lima become Copenhagen redux? 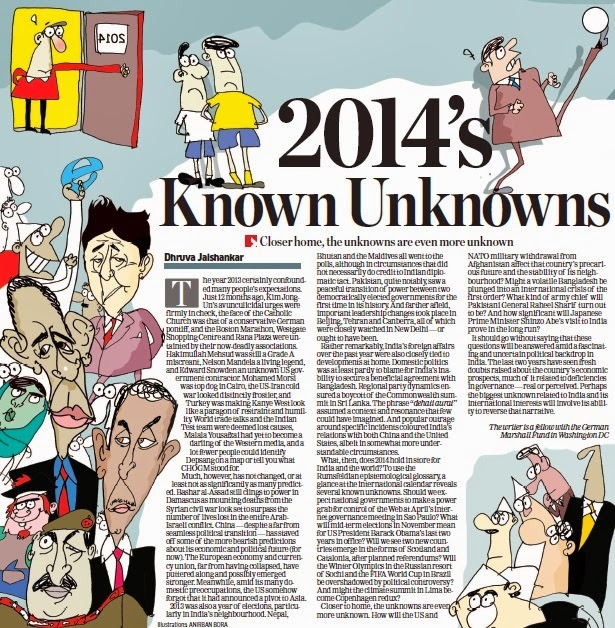 Closer to home, the unknowns are even more unknown. How will the US and NATO military withdrawal from Afghanistan affect that country’s precarious future and the stability of its neighbourhood? Might a volatile Bangladesh be plunged into an international crisis of the first order? What kind of army chief will Pakistani General Raheel Sharif turn out to be? And how significant will Japanese Prime Minister Shinzo Abe’s visit to India prove in the long run? It should go without saying that these questions will be answered amid a fascinating and uncertain political backdrop in India. The last two years have seen fresh doubts raised about the country’s economic prospects, much of it related to deficiencies in governance — real or perceived. Perhaps the biggest unknown related to India and its international interests will involve its ability to reverse that narrative.